There are multiple reasons why your hair is falling out. Imbalanced diet, medications, stress, mineral deficiency, illness, your genetics, and pollutions could all contribute to hair loss. A third of the world’s population suffers hair loss at one point in their life. Balding does not only affect middle-aged men but women too. If you are born with hair loss problems through genetics, there is little you can prevent your hair from eventually falling out. Often hair loss could be brought about by factors out of control, such as being on chemotherapy. All you can do, however, is to keep your hair and scalp at its best condition to increase the chance of it staying on your head as it should. Statistically, everyone loses hair every day on a daily basis. In fact, we lose close to eighty to one hundred strands just because of the end of the hair strand life cycle. So seeing some strands of your hair come off as you brush the hair is pretty normal. If it’s nothing more than that, then it’s just a sign that you are relatively healthy. Continue whatever lifestyle you are currently living, which should be stress-free with a balanced diet. Once you notice abnormal hair loss, it’s probably time for you to take measures. Many causes from daily life that could damage your hair health that you might not notice. Hormonal changes (stress, menopause, etc. ), excessive consumption of junk food, unhealthy lifestyle, the medication you took thyroid problems, vitamins deficiency and many more others. The first step is to find the potential cause and attempt to eliminate them before you pursue other remedies for your hair loss. Healthy food leads to healthy hair and thus prevents hair loss. A balanced diet is easily the best counter to hair loss and one of the most effective ones as well. One of the major cause for unhealthy hair is body nutritional deficiencies. Consume food rich in iron, zinc, omega 3 fatty acids, proteins, vitamins A, B-complex, C, and E will not only overcome the potential deficiencies but also, add moisture. This leads to a healthier scalp, fewer split ends and, of course, less hair fall. At the same time, your hair will be thicker and stronger. If you are aiming for a long-term hair loss treatment, this is the most effective. Add some of the following food to your diet: Oats, carrots, brown rice, whole grains, citrus fruits, green leafy vegetables, lentils, pumpkin seeds, sweet potatoes, oysters, grounded flaxseeds or flaxseed oil, nuts, fishes rich in omega 3 fatty acids such as tuna and salmon, beans, eggs, yogurt and low fat cheese. So for how to stop hair from falling out, you should never ignore your diet. Using hair dryer should be limited, because heat weakens the proteins in the hair. Repeated heating and drying will result in fragility and brittleness in the long run, which would then cause hair loss. Drying it naturally is still the best option for your air, consider avoiding the hair drying unless you are in a rush. Dyes and chemicals are a bane to your hair health. The more frequent you color your hair with chemicals, the higher the chance serious damage will be dealt with the hair. Dyeing the hair every four to six weeks is the most you should do to reduce the risk. Scalp health is responsible for the hair health. Impaired circulation in the scalp will lead to hair loss. A short scalp massage session will boost the circulation and mitigate the hair loss. It’s simple yet effective! Use your finger pads to move in gentle circular motions. Start from the temple and work your way up and down to the nape of the neck. Make sure that you avoid applying too much pressure since it will only irritate the scalp and cause your hair to fall out more. Moist your hand with some coconut oil before the massage for the extra hair and scalp conditioning. Aloe vera is always been used to treat hair loss, used by the Ayurveda and even the ancient Egyptian. What makes aloe vera so effective is because it contains enzymes that get rids of dead cells on the scalp which will then prevent the hair follicles clogging. Clogged hair follicles blocked nutrients from reaching the hair roots. Moreover, the alkalizing properties from aloe vera promote the optimum pH level for the hair to grow. So if you have the question of how to stop hair from falling out, aloe vera would be your first choice. To make the mask, just mix them all together to a thick paste. Cover your scalp with the mask. Your hair should be covered as well. Have the mask on for 8 hours. You can sleep with it at nights, all you would need to do is a shower cap. Wash the mask off with a mild shampoo. For the best result, continue usage once a week until you are rewarded with the voluminous hair. Overwhelming stress is just terrible for your health and beauty in general, but it does also affect hair loss. Stress raises the cortisol level, which contributes to more hair falling out. Learn to relieve your stress and your hair health should improve. Regular exercise, regular sleep schedule, meditation or other activity that let you release the valve. Or if you are like me, learn to control the habit of pulling on the hair when under stressful condition. Several studies have discovered that biotin supplements are effective in combating brittle nails and thinning nails. Biotin is grouped under the B-complex vitamins, but is also known as the vitamin H. Vitamin B complex is excellent for your body metabolism of protein and fats. Daily supplements are recommended by some experts due to its general safety and difficult to receive from the everyday diet. Asking for professional help is always recommended at all stages of hair loss. On average, three months is what it will take for something to eventually affect the hair, making finding the trigger of your hair loss often difficult. Significant weight loss, change in diet, new shampoo or significant weight loss can all be a factor. Visit a doctor for the right diagnosis. 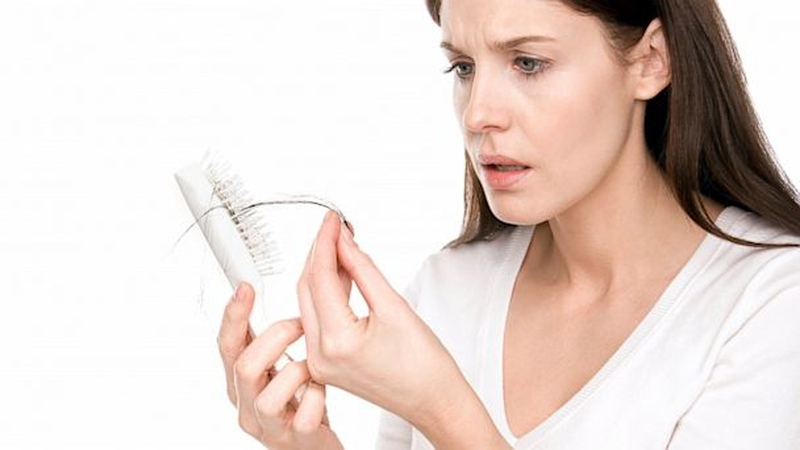 Most hair loss is fixable, but you will need to determine what exactly cause it. Server responsed at: 04/18/2019 8:40 p.m.